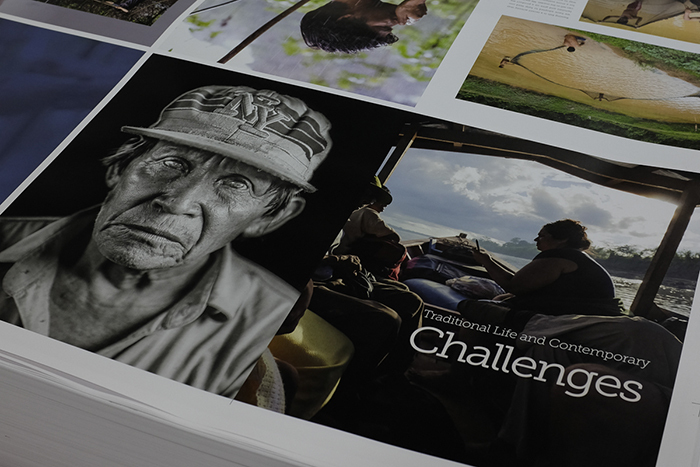 A hardcover documentary book about the Ese'Eja accompanies the tour and will be launched during a public open reception at the Peruvian embassy. Photo by Andrew Bale. This summer, photographs by Andrew Bale, lecturer in art & art history, are featured in a touring exhibition, in a major cultural festival headed by a Smithsonian museum and in a documentary book. The exhibition, “The Ese’Eja People of the Amazon: Connected by a Thread,” was created by Bale and the University of Delaware’s Jon Cox, Vicki Cassman and Monica Dominguez Torres as part of a National Geographic-sponsored cultural-mapping photo and video multimedia project to preserve and protect the Ese’Eja culture, an indigenous hunting, gathering and fishing society living in the Amazonian region of Peru. Photos from the project, taken by Bale, Cox and student-photographer Wesley Lickus '17, were exhibited at Dickinson in 2016. The project kicks off its current tour at the Peruvian embassy in Washington, D.C., where it will be shown from July 13 to September 15. The photographs also will be highlighted during the Smithsonian’s Museum of the American Indian’s Kaypi Peru (“This Is Peru”) festival, a free public event in Washington, D.C., that has attracted as many as 36,000 visitors in previous years. Held July 27-30, the 2017 festival highlights Peruvian cultural heritage and arts through live performances, hands-on activities, food and exhibitions. A hardcover documentary book, Ancestral Lands of the Ese’Eja: The True People, accompanies the exhibition tour. To celebrate the joint book and exhibition launch, the Peruvian embassy will host a free public opening reception and book signing on July 13 at 6 p.m. Available at the embassy’s opening reception, at the Kaypi Peru festival and on eseeja.org, the book is published by the ACEER Foundation, an organization that promotes the conservation of the Peruvian Amazon. It has been called “a great illustration of the methods of beginning the healing process” of population decline (Lenape Principal Chief Dennis J. Coker), “beautiful and stunning” and “extraordinary” (Nora Bynum, Field Museum) and “a beautiful, poignant, and timely glimpse into the history, present, and precarious future of one of Amazonia’s native people" (James A. Duke). All proceeds from book signings and print sales will support the foundation’s sustainable projects in the Ese'Eja communities and fund its Conservation Learning program. Additional showings of “Connected by a Thread” at Boise State University, Longwood Gardens, West Chester University and Central Michigan University are planned for 2018. This project is supported by Dickinson, the ACEER Foundation, the embassy of Peru, Hahnemühle, National Geographic, Rainforest Expeditions and the University of Delaware.